Wildcard Weather is up and running again! Welcome back and thank you to readers who have been here before. For any new readers, I will give a short explanation of my intentions with this blog. I am a meteorology graduate student, about to graduate, and one thing I love about meteorology is sharing it with others. I will try to introduce you to weather science and news at a level most should understand without insulting your collective intelligence. This will not be ripped from my textbooks, but it won’t be dumbed-down to grade school level either. Feel free to e-mail me at wildcardweather@gmail.com with any comments or questions and I highly implore you to comment on my posts. Now I want to ease back into the blogging over the next few weeks, but I saw an article on Popular Science that really caught my eye. The article was posted today and is about a huge hurricane-like storm swirling around Saturn‘s north pole. Scientists have known about a similar storm at the planet’s south pole for years but the darkness of Saturn’s 30-year seasons presented us from glimpsing the north. With the coming spring, we are getting our first view of a storm large enough to fit two Earths and strong enough to produce 300 mph winds. It swirls counter-clockwise like a hurricane on Earth and has probably been there for many many years. 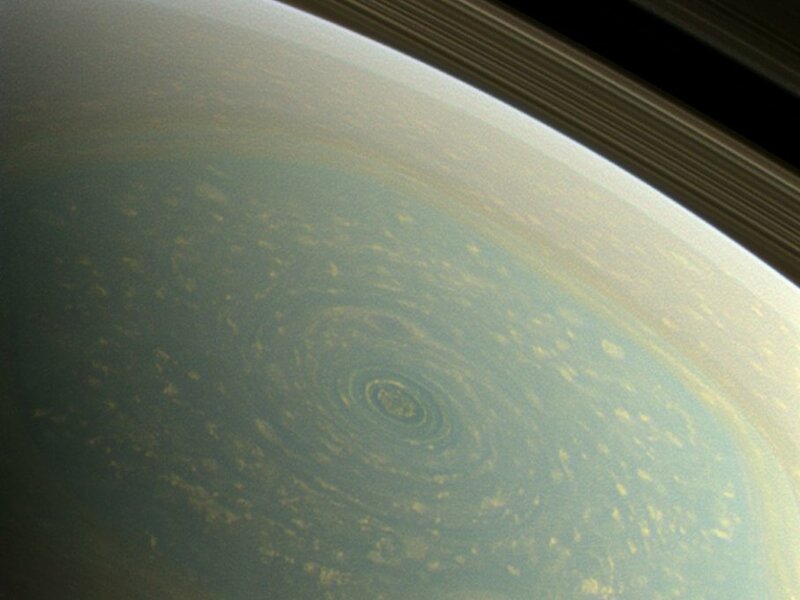 The storm at Saturn’s north pole in true color. Why is it there? Why hasn’t it dissipated? Well on Earth a strong hurricane would dissipate as soon as it hit land or was too far removed from the warm ocean water that provide it with energy. On Saturn there is no land, and the storm’s energy comes from the planet’s interior. There is nothing to slow the storms on either pole. When astronomer’s discover the storm on the southern pole it was theorized that the storms were a seasonal phenomena. The discovery of a storm emerging from Saturn’s long winter show that these storms exist throughout the planet’s orbit. Studying storms like this one is important to meteorologists here on Earth. Hurricane are complex systems that we do not fully understand. A gigantic, permanent hurricane would allow us to study the structure of hurricanes in a way we are unable to on Earth. Now I know what you’re thinking. How can a storm on the giant gas-giant Saturn apply in any way to hurricanes we see on Earth? Well the answer is physics, they are universal. The laws that govern physics here govern physics on Saturn. If the storms on Saturn can help us understand the nature of hurricanes in any way, they may allow us to better forecast hurricanes on Earth. Thank you again for returning to Wildcard Weather. I’m hoping to get a post up soon on the 2013 Hurricane Season and current forecasts.